The victorious DCU Freshers' Hurling side celebrating after their win over UL in Portarlington. Image Credit: DCU Hurling Club. 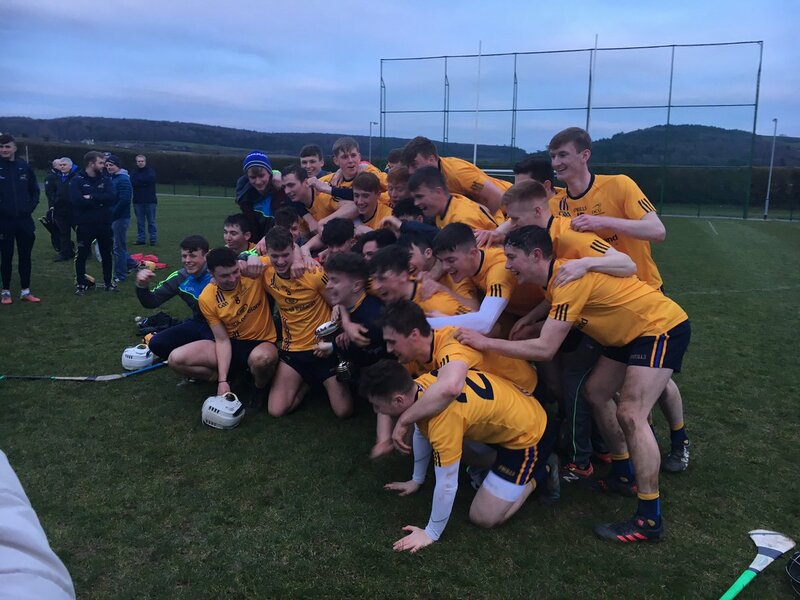 The college defeated the University of Limerick on a scoreline of 1-20 to 2-15 in a repeat of last year’s final where the Glasnevin university also triumphed. The game was played at an immensely high level with a plethora of inter-county stars on both sides. Wexford trio Damien Reck, Rory O’Connor and Murtha Doyle notched up a goal and eight points from play between them, in what was a dominant performance. DCU led from start to finish and looked like the better side after the first ten minutes struck up a 0-6 to 0-2 lead for the Dublin university. The scoreline flattered UL, who kept DCU from pulling away on two occasions when goals reduced the lead. DCU was under brief pressure in the closing stages however after a fortuitous Jake Morris goal left a minimal deficit between the sides with five minutes remaining. DCU remained composed and a James Burke point in the dying moments sealed the back-to-back fresher’s triumph for the university, which even got the university’s President, Brian MacCraith, excited. “Major congrats to DCU Dóchas Éireann Freshers A Hurling players & management,” he said on Twitter. Speaking after the game Rory O’Connor, a member of the Wexford Senior hurling panel, agreed with the President’s sentiment. He attributed much of the victory to the facilities afforded to the team in preparation for the cup. “The facilities here are top class and the managers and the selectors that are over all the teams are top stuff. The triumph in Stradbally came as yet another boost to hurling in DCU after the senior team competed in their first ever Fitzgibbon cup final this year. The St. Martin’s club man said that hurling is on the up in DCU and that to even get a place on next year’s Fitzgibbon Cup panel would be an impressive feat. “Hurling is going in DCU at the moment,” he said. While O’Connor recognised the talent of the current crop of Fitzgibbon Cup hurlers, Paul O’Brien, Gaelic Games Development Officer in DCU, said that this fresher’s hurling team are too good to be kept off the pitch next year. “It’s a very strong fresher’s team and I would be expecting certainly close to double figures to go into the Fitzgibbon panel next year,” he said. O’Brien was confident that with the calibre of players joining an already impressive squad, DCU will be in strong contention to win the Fitzgibbon cup in coming years. He added that they could even cement themselves as the best hurling institution in Ireland. “If you look at the two panels that were in the Fitzgibbon final this year, I would consider our panel to be getting stronger and UL’s panel to be losing a few,” he said. “There’s several other teams but I suppose we’re continuing to add to our panel and that’s what you want. We set our stall out to be the best hurling college in Leinster first of all. “Ourselves and IT Carlow have been at the forefront for the last two or three years and going forward I do think it will be a case where we’re top in Leinster, top in Ireland. DCU: Dara De Poire, Jack McVeigh, Paddy Smith, Shane O’Kennedy (Ballygunner, Waterford), Evan Shefflin (Ballyhale Shamrocks, Kilkenny), Peter Feeney (Na Fianna, Dublin), Conor Firman (St Martin’s, Wexford), Damien Reck (Oylegate Glenbrien, Wexford), Liam Pender (Duffry Rovers, Wexford), James Burke (Naas, Kildare), Brian Ryan (South Liberties, Limerick), Murtha Doyle (Oulart-the-Ballagh, Wexford), James Bergin (Conahy Shamrocks, Kilkenny), Colum Prendiville (Graigue-Ballycallan, Kilkenny), Rory O’Connor (St Martin’s, Wexford).